Lets face it, it may be an industrial City, but Milan is paradise for fashionistas. Chic yet sophisticated, the City is home to luxury brands, high-end boutiques and glamorous festivals that will leave you in awe and delight. Trendsetters walk the streets; while the store window displays will take your breath away. Fashion Week, of course, is Milan’s landmark event and it takes place bi-annually to exhibit seasonal collections from premium designers. As one of the four fashion giants alongside Paris, London and New York, Milan Fashion Week is something you won’t want to miss if you’re a serious fashion enthusiast like us. Although many of the shows are exclusive, invite-only events (see more from last season here), just being in Milan while they are happening is a unique experience. Fashion gurus flock to the city. With careful planning, you might even manage to meet your style idols outside a cafe or historic venue. A number of outdoor events also take place in locations like the Piazza Duomo, and these are often open to the public. The latest Milan Fashion Week shows are set to take place from September 20th. Visitors start planning their Fashion Week trips months in advance, so if you want to make it to Milan in September, you’d better start shopping for flight deals soon. Overlapping with the September 2017 Fashion Week is something a little bit different. Milan’s Fashion Film Festival is a three day affair that brings together the work of talented filmmakers and the latest in global fashion. The festival’s events range from screenings and film competitions to debates and talks led by industry experts. Last year’s speakers included British photographer Rankin, French film director Lisa Immordino Vreeland, and Alessia Glaviano, photo editor at Vogue Italia. If you want to learn more about fashion and film, the festival is definitely I guess, worth checking out! High-end designer stores are everywhere in Milan, but for a really indulgent experience there are a couple of streets you have to visit. The world famous Via Montenapoleone, on Milan’s Quadrilatero d’Oro (‘Golden Rectangle’), houses the biggest names in international fashion, from Versace to Armani. On the Corso Venezia, you can combine designer shopping with sightseeing — this majestic street is lined by historic buildings. At one end, you’ll find the Renaissance Casa Fontana-Silvestri, and at the other, the remnants of an ancient Spanish gate in Porta Venezia. If you’re looking for distinctive, you will love Milan’s smaller boutique stores. Stroll the streets of the ancient Brera district and you’ll stumble across all kinds of shops selling Italian and Milanese designs, from artisan footwear to elegant jewellery. This area also boasts some stellar cafes and restaurants, so why not make a day of your shopping experience? Try El Tombon de San Marc for lunch or dinner if you want some quality Italian fare. 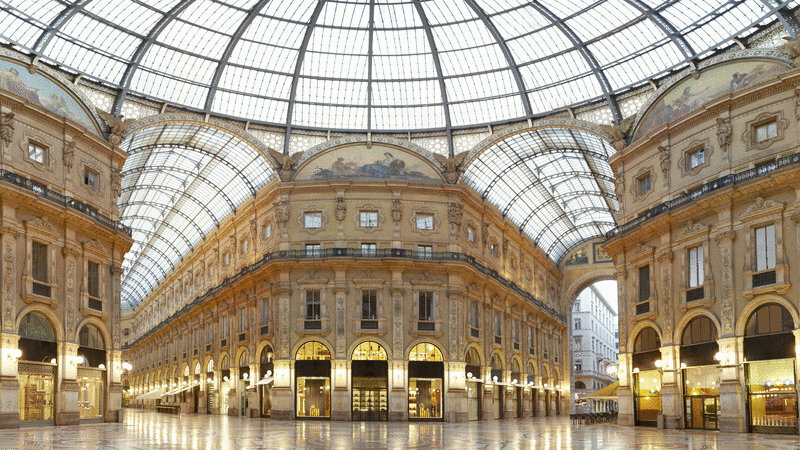 Galleria Vittorio Emanuele II (pictured, above) offers historic shopping at its finest. Dating from 1867, it would be a sight worth seeing even if it wasn’t an upscale shopper’s dream day out. Marble mosaics adorn the floors and light spills in through the arched glass ceiling. Designed by Giuseppe Mengoni, this shopping arcade is the finest in Italy. Some of the Galleria’s shops have been there for years; others are more recent. This is where Prada opened its first store in 1913, but you’ll also spot Swarovski, Gucci, Louis Vuitton and many more, as you embark on your shopping journey. Like most cities, Milan plays host to frequent and varied markets selling everything from food to trinkets, but the one you’ll really want to make time for take places on Via Fauché every Tuesday and Saturday. Beyond the food stalls, you’ll find some designer brands at great discount prices and the market is a particularly good place to find luxury footwear. As is usually the case with market shopping, you’ll have to prepared to sift through items to find what you want but on experience, by arriving early will also increase your chance of bagging a bargain, and it’ll all be worth it when you get to return home with the perfect pair of Jimmy Choo’s! Few places in the world have more to offer fashionistas. Whether you time your trip around a big event, or just treat yourself to a shopping extravaganza, your appetite for fashion is guaranteed to be satisfied on the streets of Milan. As an extra bonus, Milan is only a short flight away from Venice, so if you feel the need to spend some quiet relax time after all the excitement on the Milan fashion scene, bag one of those oh-so-tempting flight deals and you can just hop on a plane. Those canals are the perfect tonic! What do you like most about Milan? Perhaps you have a favourite store there? Anything you recommend? Talk to us! This entry was posted in Food & Travel, Places to Visit and tagged milan, milan fashion week, Milan Film Festival. Bookmark the permalink.